One of the highlight feature of Windows 7 is the Jump List. They are designed to make it easier to find what you want and perform common operations associated with an application. 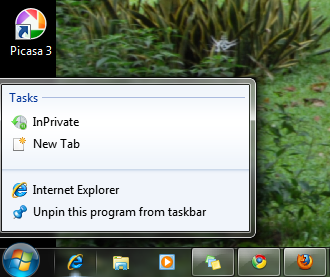 Jump Lists appear on the Start menu as well as on the Taskbar when you right-click on an icon. To quick access a particular jump list, you can use the shortcut key WinKey+Alt+[number]. In the example screenshot above, WinKey+Alt+1 was used to open Internet Explorer jump list. Number 1 was pressed because it is sitting on the first position on the taskbar. You can also cycle between jumplists by pressing WinKey+Alt+1, WinKey+Alt+2, etc.